TOKYO (AP) — "Pokemon Go" players are descending on an atomic bomb memorial park in Hiroshima, and officials of the western Japanese city are displeased. They have asked game developer Niantic Inc. to remove the "Pokestops" and other virtual sites that show up in the park for those playing the augmented-reality game. The city wants them deleted by Aug. 6, the anniversary of the 1945 bombing and the date of an annual ceremony to remember the victims. Niantic declined to comment, saying it would not make public any discussions with a third party. 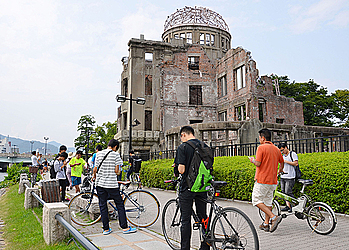 The expansive Hiroshima Peace Memorial Park is meant as a solemn memorial to the victims. It has become a draw for players since the Japan release of the addictive smartphone game last Friday. Elsewhere, the U.S. Holocaust Memorial Museum in Washington, D.C., and nearby Arlington National Cemetery have made similar requests to Niantic. Holocaust museum spokesman Andrew Hollinger said Wednesday that the museum had been removed from the game according to its wishes. Niantic offers a form to request exclusions, but it's neither automatic nor guaranteed. The location-aware app gives digital rewards for visiting real places that have been designated "Pokestops" and "Gyms" in the game.